This 6 night Taste of The North tour travels through Ireland’s best kept secret – the Northern territories. See Ireland in a week with this amazing tour. Discover Northern Ireland’s greatest treasures in the shortest amount of time on this self drive tour. Visit Belfast city with its newly opened Titanic Experience, it’s grand Victorian buildings and excellent bars and restaurants. 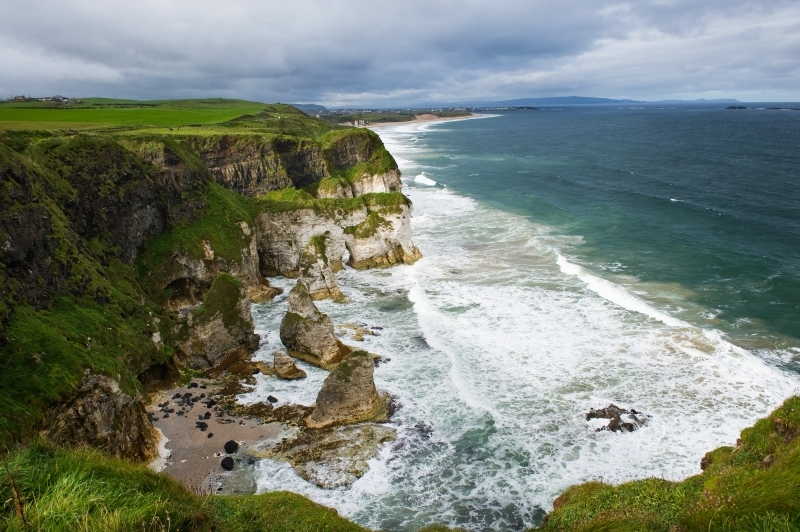 Explore the magnificent scenery, craggy headlands and dramatic ruins of the wild unspoilt Antrim Coast. How are you going to see Ireland in a week? Check out our open ended itinerary here! While Belfast in a fascinating city, as you travel in that direction from Dublin, you will be passing through some of the most historic parts of Ireland. You will have the opportunity to visit world renowned locations such as the megalithic tombs at Newgrange, the Hill of Tara and Trim Castle. There is also the beautiful scenic route that takes you along the coast of County Down and the Mountains of Mourne. One of the great wonders of the ancient world, Newgrange is older than Stonehenge, Mycenae or even the Pyramids of Egypt. Foremost among the passage-tombs of Europe, Newgrange has long evoked the wonder of archaeologists and laymen alike. The magnificent entrance slab – ‘one of the most famous stones in the entire repertory of megalithic art’ – is especially satisfying, the confidently executed spiral and lozenge motifs still crisply defined after 5,000 years. Not far from here is Trim Castle. The castle, on the shores of the Boyne, has an area of 30,000 m². It is the remains of the largest Norman castle in Europe, and Ireland’s largest castle. Just north of here lies The Hill of Tara. Located near the River Boyne, this ancient contains a number of ancient monuments, and, according to tradition, was the seat of the High Kings of Ireland. On to Belfast – The world’s largest dry dock is here, testament to the building of the Titanic here. Take one of the cities famed Black Cab Tours and let your experienced, impartial and friendly driver acquaint you with the history & culture of Belfast. Tours include The Titanic and Cathedral Quarter and other areas of the city including visiting some of the famous murals that represent both sides of the political divide. From Belfast, head north to the beautiful Glens of Antrim dotted with quaint villages. From here, make sure to walk the stunning Carrick-a-Rede Rope Bridge spans a gaping chasm between the coast and a small island used by fishermen. The terrifying eighty foot drop can be crossed via the swinging bridge – not for the faint hearted! 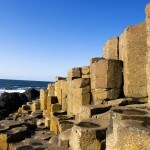 From here travel to the Giant’s Causeway. At one time considered to be one of the wonders of the world, the fact that the Causeway was formed 70,000,000 years ago by massive volcanic activity is contradicted only by local legend. Clearly this was giants’ work and, more particularly, the work of the giant Finn McCool, the Ulster warrior and commander of the King of Ireland’s armies. Today is a leisurely day with less driving! Travel to the nearby Dunluce Castle, this spectacular castle was shaped when the sea cut deep into the land, exploiting cracks in either side of the rock. The early Christians and the Vikings were drawn to this romantic place. An early Irish fort once stood here Ireland which is famous for it’s whiskey. We strongly recommend a visit the Bushmills Distillery, as the oldest distillery of its kind in the world, officially licensed in 1608. Visitors take a walk-through tour of the plant to view the whole process, essentially unchanged over the centuries. The tour ends in the “Potstill Bar” a pub-style “tasting room” where guests are invited to sample the results. The ancient territory of the Inishowen Peninsula is the most northerly part of Ireland. Monuments of an earlier age seem to grow from the landscape as castles, towers and ancient churches shimmer in the sunshine. Your tour begins at Grianan an Aileach, the ancient Temple of the Sun that was Christianized by St. Patrick. Founded by the Druids, this ring fort dates back to some 2,000 years B.C. The panoramic view from the walls of this ancient palace is truly magnificent; seven counties can be seen on a clear day. Onwards north to Buncrana and the Tullyarvan Mill – a tastefully restored corn mill dating from the 19th century, today developed as a local craft centre and tourist amenity. From Buncrana , head to Dunree Head and Fort Dunree, constructed in 1798 by the English as a defensive measure against Napoleonic invasion. At the top of the Inishowen Peninsula is Ireland’s most northerly point, Malin Head. It is not just Ireland’s most northerly point, but also an area of great scenic beauty and of historical, scientific and ecological importance. The area is steeped in history and folklore. Continuing around the peninsula, you arrive at the pretty village of Culduff with its stone circle. Deep in the heart of County Donegal is Glenveagh National Park and is considered by many to be Ireland’s finest national park. At the core of the park is the Glenveagh Estate, originally the home of the notorious landlord John George Adair, much despised for his eviction of Irish tenant farmers in the 1860s. In the south of the county, you will find the magnificent Slieve League Cliffs. At over 1,000 ft (300 metres) the cliffs are the highest marine cliffs in Europe. Today take the direct route to Dublin so you will have time to visit some of the highlights of the capital city. The dilemma that you will be faced with when you reach Dublin is, not what you should see but that you should leave out. Knee-deep in history and with its own unique sense of humour and wit, Dublin is an invigorating city. Take the opportunity to visit some of Ireland’s most history laden locations, including Trinity College and the Book of Kells, Dublin Castle, Kilmainham Gaol, The National History Museum and not forgetting The Guinness Brewery & St. Patrick’s Cathedral. No trip to the south would be complete without Dublin’s newest visitor attraction: EPIC Ireland. Over the centuries, some 10 million people have left the island of Ireland. EPIC Ireland tells the dramatic story of how these people have spread around the globe, and how they changed the world. Through 20 state-of-the-art galleries, visitors immerse themselves in the stories of some of the most remarkable tales of sacrifice, endurance, adventure, and discovery the world has ever known. Located in The chq Building in the heart of Dublin‘s docklands, EPIC Ireland brings these amazing stories to life in a unique and spectacular way, never experienced before. Why not finish up the day in Dublin’s Temple Bar section and enjoy the wonderful pubs and music it is famous for. 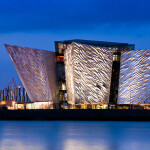 The newly-opened Titanic Belfast is a “must see” visit in any tour of Belfast and Northern Ireland. It is located in the heart of Belfast, right beside the historic site of this world-famous ship’s construction. Housed in an iconic, 6-floor building, this state-of-the-art visitor experience tells the story of the Titanic. From her conception in Belfast in the early 1900s, through her construction and launch, to her famous maiden voyage and tragic end. The adventure begins the moment you walk through the door and into the building’s giant atrium surrounded by the four ‘ship’s hull’ shaped wings which house the Titanic Experience. As you journey through the nine large galleries of this state-of-the-art interactive exhibition, you will uncover the true story of the Titanic. Located in the heart of the St James’s Gate Brewery, which has been home to the black stuff since 1759, Guinness Storehouse is Ireland’s Number One Visitor Attraction and you simply cannot leave Dublin without having paid a visit. The massive seven-storey building, a former Guinness fermentation plant, has been remodelled into the shape of a giant pint of Guinness. A visit will teach you everything you ever wanted to know about this world famous beer from how Guinness is made to the ancient craft of Guinness barrel making in the Cooperage. The highlight for many visitors is the Gravity Bar. Here visitors receive a complimentary pint of Guinness and can relax and enjoy the breathtaking 360-degree views across Dublin City. You’ve decided you want to see Ireland in a week but have decided a coach tour isn’t for you. No problem! Check out more open ended itineraries with our car tours. Or how about a golf tour? Check out our dedicated golf site.